What a treat to review UK based Earthling Society again. This band has been around since 2000 but in those years they've been quite busy, with 7 full lengths. This is their latest and one of their greatest, Zodiak. Their seventh studio album also skims the boundaries between progressive, kraut, space and psych rock while remaining in a territory all their own. Zodiak never stops surprising you throughout its entire running time and creates an extremely melodic yet bold and adventuresome musical tapestry. 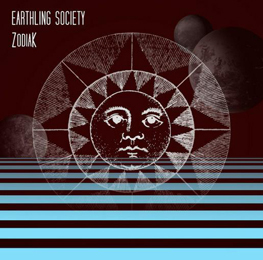 Earthling Society have always been one of those bands that does things the way they think they should be done, not the way they think will sell the most albums. It’s really a difficult task to describe what you will hear listening to the entire album. The album consists of six tracks, ranging from the two minute avant garde piece “The city of resurrections“ to the 29-minute title track. Two epic songs make up a majority of the album’s musical thrust and highlight the band’s progressive bent.. “Zodiak” is an awesome punchy guitar driven Hawkwind-blast with a mind-blowing middle piece. Another lengthy standout track is “Astral traveller” a tripped out slab of space chaos that bubbles, drones and howls. Some parts sounds a little like Bevis Frond and Hawkwind, while other seems to be influenced by such different artists as Zion Train and Nucleus and maybe some White Noise and Neu. The tracks varies from quite improvised to more structured and theme-based. In a nutshell, this is a killer set of jammin’ psychedelia. It is the sort of release that requires more than a couple listens to really quite grasp what these earthlings from London have in mind.